Hiring a business coach is a strategic next step for most sole proprietors, not just Virtual Assistants! Don’t miss my 30% coaching offers below which expire in just a few days. If you think about it, no CEO does everything alone when it comes to running a business. They have assistants and advisers and many people that help keep them focused on and on track. A lot of times they also have a board of directors that create the focus and goals for them. They only have to implement them. If you’re still in start-up phase in your VA business, finding a business coach who specializes in start-up of a business like yours can be invaluable. Especially someone who has been there and done it in the virtual assistant world because they already know the steps to take and how to direct you. Once you’ve built your virtual assistant business to a particular level, it can be uncomfortable to push through to the next stage. But a trained and experienced business coach can give you the guidance and push (shove if needed) to move your business up a level. When you share your goals, they’ll help you create steps to reach them. Sometimes a Virtual Assistant just gets stuck and has no idea at all what they need to do to move forward. Sometimes they’re not even sure if they even want to move forward anymore. If you are stuck, and bored, and unsure of your direction, a business coach can help guide you and give you clarity. Many Virtual Assistants suffer from “shiny object syndrome” which is dangerous to the direction of the business. It can hold back a VA from achieving success because they’re always starting something new instead of finishing each project. A business coach can help you avoid this issue. Are you working more in your business and not spending time with your family? Or, is your family intruding on your working hours so that you cannot become successful in your business? Either way, good business coach can help you reach balance so that you have a good life. Being a Virtual Assistant has its advantages but it also has many risks, including the fact that you’re not accountable to anyone. Having someone to whom you’re accountable who isn’t afraid to call you out when necessary is an essential way to create a successful business. Again and again, in my coaching discussions with Virtual Assistants, I see that the knowledge and wisdom I’ve acquired over the years is TEACHABLE. And the challenges inherent to starting a VA business are COACHABLE. I’d love to help you LEAP OVER the roadblocks that are stopping you from achieving your dreams of being a highly successful Virtual Assistant. So that it doesn’t take you 10 years to reach your business goals! I’ve personally coached 100’s of Virtual Assistants since 2003. I don’t hold anything back with my protégés. I give everything I have and then some. 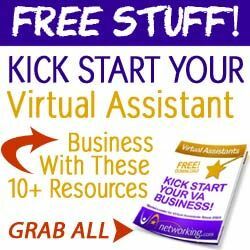 Virtual Assistants who work with me one-on-one get the full benefit of my skills, experience and PASSION for helping them succeed online in this increasingly competitive industry. 1. BEST DEAL! Private 1-on-1 MotiVAtor Coaching Sessions – Through these private sessions with me, you will receive objective feedback on your business processes and marketing, your “next big thing” ideas for growth, and HOW to set and achieve bigger and bigger goals—financial or otherwise. I’ll help you put together the missing pieces. I’ll answer your questions and will motivate you so that nothing can hold you back, allowing your VA business to thrive and grow. In the end, my desire is for you to have the VA business that gives you the lifestyle you want. 2. BUDGET DEAL! VAinsiders Strategic Group Coaching – I love engaging with other Virtual Assistants through our monthly Group Coaching sessions at my VAinsiders Club. I feel it’s super important to be held accountable and motiVAted to think at a deeper level and to share your successes and tribulations in a comfortable and friendly group environment. These sessions usually have up to 15 attendees, last 1-2 hours and are held monthly. Want to know what it’s like to attend a group coaching session with me? Yeah that’s quite true.When I started the career of Virtual Assistant ,I thought that I could train my self by self learning and that went well in the beginning. But after some time I got stuck and had no idea what to do to increase my level of efficiency. My friend recommended me to take assistance from a business coach which I did. After taking instruction and guidance from business coach now by the grace of God I am a Pro Virtual Assistant.